The Easter Chicks have flown the coop! 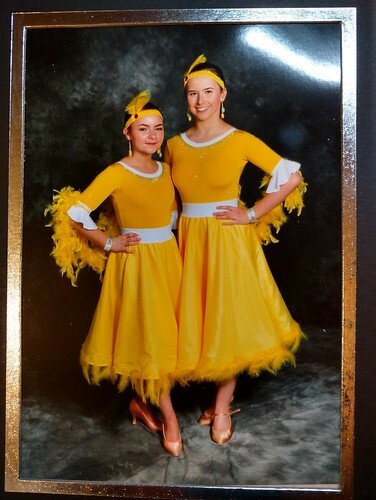 The dance comp was today and my two Easter Chicklets hit the floor running. 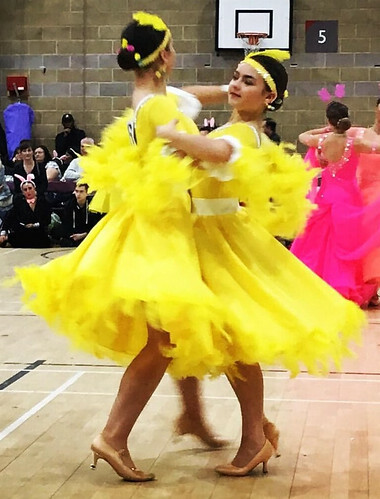 Delighted to see the little flappers come 1st in their Quickstep - those chicks really flew! They were really pleased to win two big Lindt chocolate bunnies in the fancy dress competition prompting lots more 'birdy dance' style elbow waving of their boa wings! The dresses themselves were very cheep ( ) to make with everything from bits I had left over from other dresses with the exception of the top layer of skirt. Unfortunately I picked up the dreaded winter virus (that I foolishly thought I'd escaped) shortly after completing the leotards but not the skirts so those have been a bit of a nightmare, not least because I sewed the feathers differently on the skirts then ran out with no time left to get more for Lily's partner. You can tell in the posed photo but not as they sped around the dancefloor. I was still attaching mini chicks onto hairpins to stick around their buns at the comp with very shaky hands because the virus has decided on a second assault - I've felt like I'm sleep walking all day but it was all worth it in the end as everyone had great fun and the girls even agreed to have a 'proper' photo taken as chicks. Next fancy dress is for the October regional in October - Halloween! A pair of sultry Latin Morticias perhaps... How do I decorate their hair buns as a giant sparkly spider? Has to be glittered up hair nets and pipe cleaner legs with rhinestones I suppose. Re: The Easter Chicks have flown the coop! Beautiful @Marniesews I hope those two realise the effort you have taken. It must be so much fun to try these flights of fancy ,but not when you are feeling so poorly. Things change though and with a bit of luck one day when they're sitting up ridiculously late doing stuff for their own kids, they'll remember. All of us grown ups got far more pleasure out of it, even without our share of the chocolate and they do have a better understanding of the input. MS, they are fabulous! Those feathers must have taken forever to sew on! Hope they saved you some Choc! Wow, those are soooo fabulous!! And well done to them for coming 1st! Trying to remember sewing is for fun! Used to be CarolC. If life gives you lemons, add to gin and tonic ! I've only just discovered this thread, the girls and the dresses look superb Marniesews - well done to you and to the girls for coming 1st. Now which one is your grand-daughter? Lily is the taller one. Her partner is very petite but still growing while Lil stopped growing a few years ago. They look good dancing as an all girl couple and most importantly they have a really happy partnership. Marnie they look amazing and well done to them for winning.